The City of Toronto just got even more Google Glass friendly with seven new Glass apps created as a result of Canada’s second annual Glass hackathon. The hackathon, which wrapped up this weekend at the MaRS Discovery District, challenged teams to create apps for Google Glass to make the city a better place using the heads-up display. This year’s hackathon saw three times the amount of Google Glass Explorers with fifteen Glass owners participating between eight teams. The amount of Glass devices in one room made this event one of the largest gatherings of Google Glass explorers in Canada. Organizer and Google Glass pioneer Macy Kuang put together this year’s hack to bring together the growing Glass community here in Canada and create apps to give back to the city. The hackathon was supported by the City of Toronto, who kicked things off by presenting to the teams the various data sets available for developers to use in applications via the city’s Open Data program. Teams presented their working prototypes and some ready-to-launch apps Sunday night in a friendly, non-competitive, presentation to all those participating. Perhaps no surprise, the most common city problem tackled by the group was parking with three teams deciding to create parking apps for Glass. Echoing the collaborative format of the hack, two of these groups decided to join forces mid-way through the hack which resulted in a powerful parking app for Glass called City Spot. 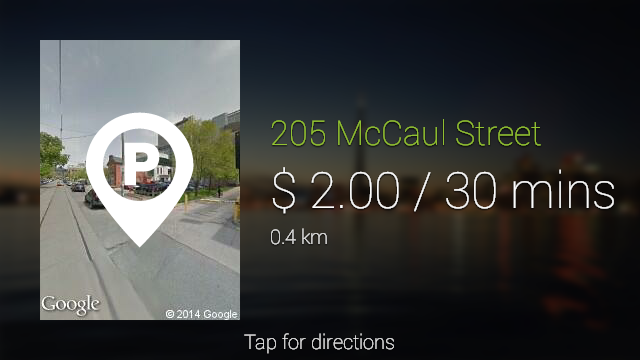 City Spot uses Glass to help users find the closest or cheapest parking spots in the city of Toronto. Using the Green P data set from the city’s Open Data API along with the GPS of the device, the app guides Glass users to the best parking lot. The app uses Glass’ directions feature to not only give driving directions to the lot, but walking directions back to a car so users don’t waste time trying to remember where they parked. The 311 Toronto Glass app showed how Glass’ inherit camera and voice note functionalities could make reporting issues and complaints to the city faster, easier and more effective. This Glass app allows users to choose a complaint category like Noise, Graffiti or Garbage and then take a picture of the situation. Users can also add some details, simply by saying it aloud to the device before tapping, to send it directly to the city via its 311 API. As the complaint is also geo-tagged, the city will know exactly where to go to correct the issue. Inspired by the movie Her, one team created a smart operating system-like app for the smart car, Tesla. 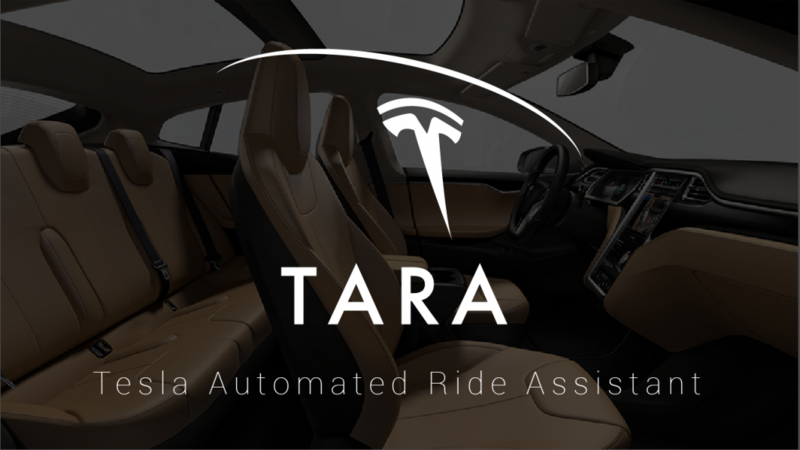 Called TARA (Tesla Automated Ride Assistant), the Glass app is dedicated to making the Tesla driving experience personalized for Glass Explorers. TARA brings the Tesla car to life for Google Glass users. Once the car is in drive, TARA will take a look at the weather outside and then suggest an in-car climate by speaking to them on Glass. All the user has to do is respond Yes or No to TARA and she will change the climate, open the sunroof and even tell you the car’s charging status by connecting directly to the car. The app shows a future where wearable devices are used to create a customized experience in the physical world in way we are used to mainly in the digital one today. Some of the other city-centric apps coming out of the hack included GlassBeach, which helps users understand the beach water quality; Casa, a real estate app for Glass that shows you nearby locations for sale and neighbourhood demographic data around it; and Glass Tour Guide, an app that creates a walking tour out of nearby attractions in the city.